Admit it - you've been there! 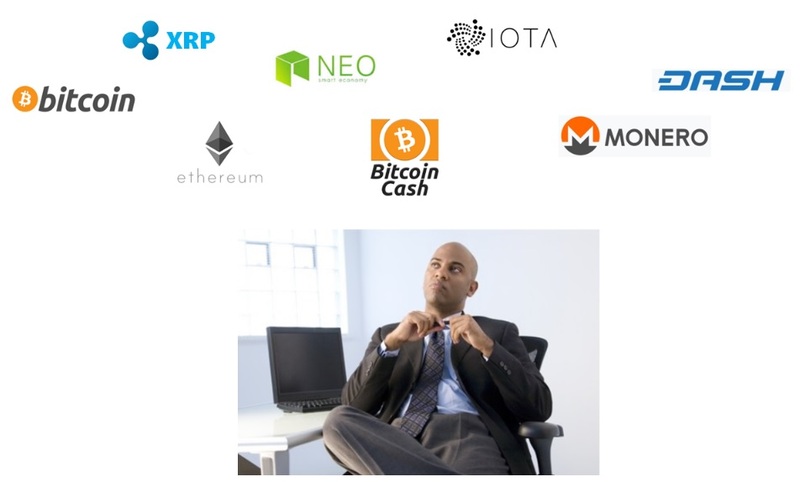 You have some fresh investment money from your latest paycheck, and you're wondering where to invest it in crypto-land. Bitcoin has been gaining, but so has Ethereum and XRP. Bitcoin Cash? Iota? NEO? Maybe Monero or Dash? How do you go about making your choices? Are you in it for one or two days, hoping for a quick 10% gain? Or perhaps you're looking for a swing trade or long-term "get it and forget it" type of investment to put on a freshly-purchased nano? When looking for a swing or long-term trade, you should do a checklist comparison of the the coins you're considering. It takes time. It's tedious (believe me - I've done multiple checklist comparisons). It requires objectivity and seeking out multiple opinions from a diverse set of people - if you're interested in obtaining an unbiased perspective. If you're thinking of Bitcoin, Ethereum or XRP, you're in luck; I've done that comparison for you! My checklist is based on the bullet-point list of factors that I included in my separate bog post here. Without a doubt, this particular comparison involved the most research I've ever compiled for one topic. I began it two days ago, and in my references I included the date and time for many of the specific items that change on a day-to-day (or minute-by-minute) basis. This includes market capitalization amounts, volume, and network fees, among other points. While most of the checklist contains objective items and measurements, in any comparison worth its salt, some subjectivity is involved, and you'll see that in some of the categories. I've attempted to provide context for these items as well within the list itself; I will also describe some of the high points later. If you already knew these two items, then congratulations! I had no idea prior to tracking down the sources for some of these entries. When I'd done my earlier research, it was more informal; I guess when a writer is forced to methodically document sources, they end up learning some things that they might otherwise have missed! I'm an XRP investor - that is no secret, and it's due to the fact that I've done these types of comparisons starting in 2013 when I first learned about XRP and Ripple (the company). I quickly became a fan of Ripple after learning about some of their team members and seeing the quality of the XRP Ledger for myself. Despite my predisposition towards XRP and Ripple, I did not pull any punches in this comparison. Am I still on board with XRP? Yes; Enthusiastically! While 29 worldwide exchanges is a huge number that puts XRP head and shoulders above other crypto-currencies and digital assets, I'd feel better at doubling this number in the next few months. How much am I concerned? 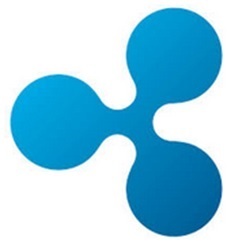 Not appreciably, as most major exchanges carry XRP, and Ripple has made it clear that they are expanding into both China and India - two of the largest potential markets in the world. Ripple has made great strides in diversification of its validator list, as I described in my blog here. However, I think the vision has not yet been realized of a large number of RippleNet stakeholder organizations being trusted enough to be included in Ripple's default trusted nodes list. How much am I concerned? Not in the slightest. While some competitors may harp on this point, I do not foresee any scenario where Ripple benefits from abuse of this current "highly trusted" status in the network. Because of my analysis from a business risk standpoint, I am completely comfortable with this temporary transition to a fully decentralized network when it makes the most business sense. By the way - in case any crypto-anarchists are snickering at this point - the XRP Ledger is decentralized despite Ripple's current status listing in the "default" trusted nodes list; anybody can switch this status and choose to trust other nodes as they wish, and even if Ripple (the company) disappeared tomorrow, the XRP Ledger would still exist. 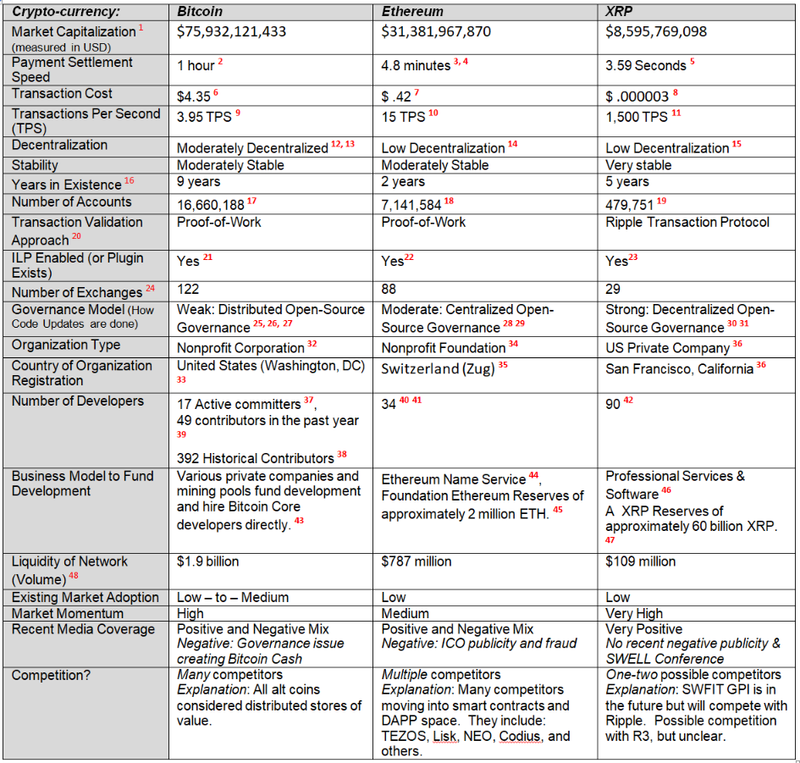 I didn't have another category, and in hindsight I probably should have; "business model to fund adoption." The two non-profits have resources and are funded by interested parties, and in the case of Ethereum, a substantial amount of Ether held in reserve. But neither of these two can compare with the massive amount of XRP that Ripple has at its disposal to supercharge banking adoption. Yes, most of this XRP will be locked up in a revolving escrow for the next thirty years, 49 but even so, the monthly release amount should be all that is required for Ripple to fund an unstoppable wave of worldwide adoption by banks, financial institutions, and trade platforms and exchanges. Of course, when it comes to XRP, market momentum is not just measured by the crypto market response to XRP; it's measured by banking adoption numbers and by banking adoption progress generally. 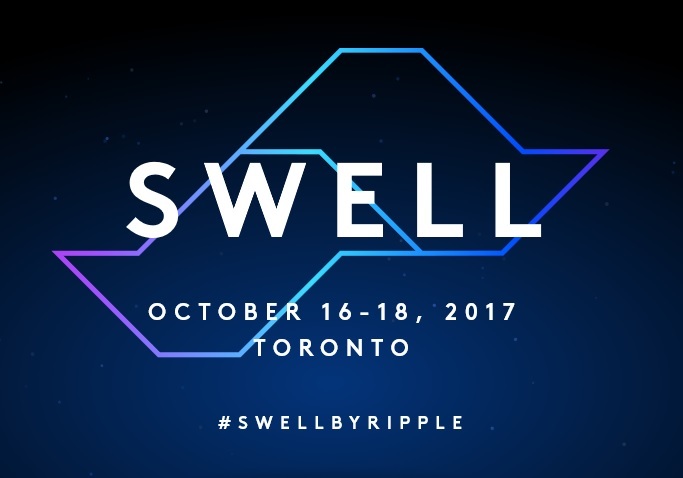 Clearly, Ripple has shifted into high gear and is looking to add many new customers to their pipeline with the SWELL conference. My only concern? Is Ripple ready to scale quickly enough to meet the demand that the SWELL conference is about to generate? What does the future hold in store for the one company that is quickly becoming regarded as the "Google" of crypto? The history of silicon valley has numerous examples of what can happen to a quickly growing start-up that's suddenly realized the potential of its visionary business model. Going public? Takeover? While these might be distracting to your comparison of investment choices, do not discount them. I predict that 2018 will see some dramatic changes in banking techno-architecture from Ripple, and I also foresee an immense amount of publicity and all that goes with it. My honest advice to anybody that hasn't done so already? Add some XRP to your portfolio, and do it quickly.